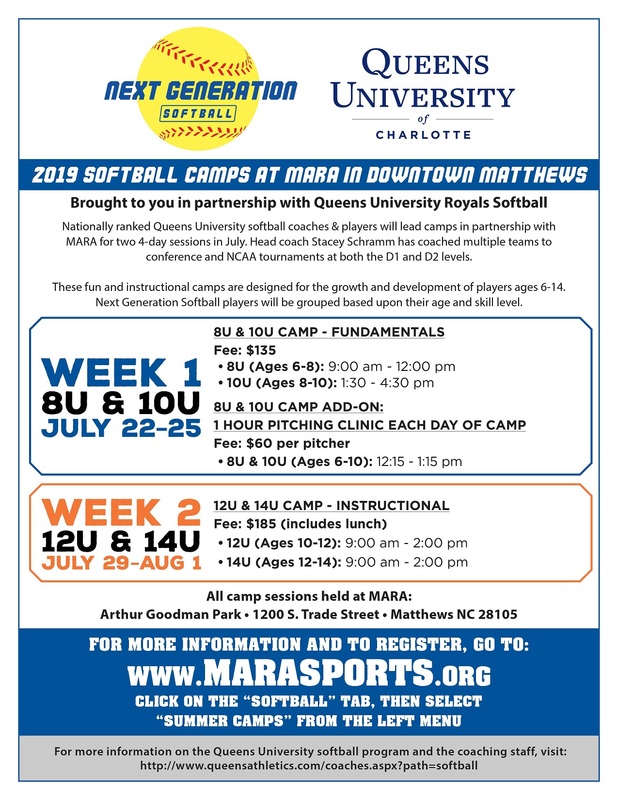 MARA Softball (8U, 10U, and 13U) will once again be participating in the Char-Meck Softball All-Star Tournament at the end of the Spring season from Thursday, June 13th - Sunday, June 16th. Selection to the All-Star teams is an honor for the players. As such, there are specific expectations and commitments that families and players MUST abide by to be considered for the All-Star teams. MARA Softball players and families will be sent the Softball All-Star Committment Letter noting the commitments and requirements. Send an email to the Softball Commissioner at mara_softball@live.com with your commitment to the All-Star trail. Turn in the signed hard-copy letter to their respective rec team head coach or the Softball Commissioner OR Take a picture or scan the signed commitment letter email it to their respective rec team head coach or the Softball Commissioner. Only those players who turned in signed commitment letters are eligible for selection to the All-Star teams. The regular season Head Coaches (HCs) will select 9 (for 13U) and 10 (for 8U and 10U) players of the All Star teams in the respective age divisions via the following defined process. 1. The Commissioner will compile and provide the list of the committed players for each age division to the respective HCs 7 days prior to the All Star Selection. 2. The respective age division HCs will meet a minimum of 2 days prior to the All Star Selection to review player statistics, skills, and capabilities. The Commissioner or Past Commissioner, as an independent party, will moderate this discussion/meeting. 3. After the above meeting discussing the players, each regular season HC will stack rank the players from 1 through the number of players that have committed to the All Star tournament trail and are on the ballot. 4. The stack ranks will be averaged. The players with the top 9 (for 13U)/ 10 (for 10U and 8U) averaged rankings will be selected to the All Star team. 5. In the event, there is a multi-way tie in the average ranking of players respectively to not be able to determine the top 9 or 10 ranked players, those players tied will be stacked ranked and averaged to determine the player(s) joining the top 9/10 players for the All Star team. 6. Example: 10U stacked ranking of players allowed for clear determination of 1st through 5th players. There is a 6 way tie for 6th ranked player. Those 6 players would be stacked ranked and averaged again by the regular season head coaches using 1 through 6. The first 5 of those 6 would join the initial 5 players to make up the 10 players to form the 10U All Star team. Once the team is selected by the regular season HCs, the All Star Head Coach at his or her sole discretion is to select a minimum of 1 up to a maximum of 3 additional players to the roster from the pool of committed players. 8U and 10U – Minimum team size of 10 players with a maximum of 13 players. 13U – Minimum team size of 9 players with a maximum 12 players. The decision to add a 12th or 13th player on the respective teams is at the sole decision of the All Star Head Coach. Any questions about the All-Star program should be direct to the Softball Commissioner at mara_softball@live.com. Registration for 2019 Spring Softball season for ALL AGE Groups is OPEN. Also of note, CharMeck Softball has changed the 16U age group to be 18U/High School. The age group change was to allow the young ladies to enjoy the sport they love longer. Players must be 18 or younger on December 31, 2018 AND must NOT have graduated high school. Wednesday, December 19, 2018 - Registration Open for ALL age groups. Saturday, February 2, 2018 - Softball Try-it Day - Date subject to Change due to Weather. Please note the above dates are subject to change as impacted by weather and other events. If you have any questions, please reach out to Chang Zeng, MARA Softball Commissioner, at . Check MARA Website of Call Weather Line to determine if fields are open. DO NOT practice or play on a field with standing water. DO NOT remove wet dirt from the mound, home plate or baseline. Please do all warm up exercises in the outfield, but DO NOT have players stand on painted outfield lines. DO NOT use the fences for soft toss, pepper or to throw against. Please try to rotate dugouts used for practice!!!!! Rake and level home plate area…fill and tamp holes with rake. Rake and level around all bases-DO NOT rakedirt into grass area. DO NOTdrag the brooms down the baselines on fields 1, 12, 13. PLEASE TALK TO YOUR PLAYERS ABOUT DIGGING HOLES IN THE OUTFIELD TURF (This is not acceptable!!!!! )THIS IS OUR BIGGEST ISSUE. HUGE SAFETY ISSUE. Clean dugouts areas – throw all trash and litter into trash cans. Notify Commissioners of your league of any problems. Please remember that any failure to properly take care of the fields can affect other players and coaches the next day. Help keep this facility in good shape for all users.